This ‘Know Your London’ Website seeks to do what it ‘says on the tin’. The many articles have been written to explain the history of London and to help you to get to know London for your self. You will find it is a slow process but it is also very rewarding. The articles on this Website all relate to places in the City of London as well as the Inner London Boroughs. Those on the north side of the Thames: Hammersmith and Fulham; Kensington and Chelsea; Camden; Islington; Hackney and Tower Hamlets. Those on the south side of the Thames: Wandsworth; Lambeth; Southwark; Lewisham and Greenwich (recently created the ‘Royal Borough of Greenwich’). If you are looking for a particular place, like Deptford, then enter that name in the search box (on the front page) and related articles will be listed. If you are looking for places within a particular area, then ‘click’ on one of the names on the right-hand side of the page, listed under Categories. Another thing to bear in mind is that the images have a fixed width which matches the width of the text in that article. If you left-click on an image it will display at ‘full size’. The images are not enormous but better clarity can sometimes be obtained by displaying the images at their ‘original size’. Endless guidebooks have been written about the River Thames but few of them give much information about the river itself. That is probably because most of the authors copy out large chunks from other history books without having any real personal knowledge of the Thames or how it works. As well as information about London, some of the places described are beside the Thames. It is hoped that articles about these items will give the reader a better understanding of the working river. Most of the information about the Thames has been gained either from talking to men working on the river or from reading books written by people who knew how the river worked. An attempt has been made to explain the way of life of men living and working on the Thames today and of the generations from years gone by. The image at the top of this Website is a view of London in 2017 from the top of One Tree Hill, a wooded open space on the borders of Southwark and Lewisham. Adrian Prockter has been lecturing on the subject of Inner London for many years. His specialist knowledge covers the City of London, the City of Westminster (which now includes Paddington and St Marylebone), as well as the other Inner London Boroughs. 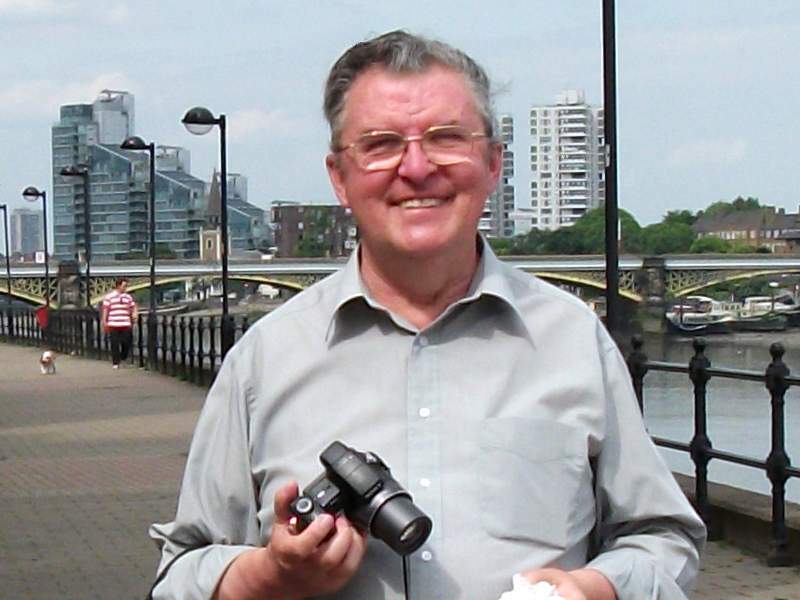 Adrian has also devoted a large part of his time to researching the history of the River Thames. For 25 years he chartered riverboats and conducted river trips from Westminster up to Hammersmith or from Westminster down to the Thames Barrier. Some of the trips were conducted for the Museum of London and others were for his own (adult) students. While conducting the tours he met many watermen and learned a considerable about the river that only those who work on the Thames would know. At the end of a long career of lecturing about the capital, finding out about the history of London and taking over a quarter of a million slides and digital images, Adrian now enjoys committing his knowledge to the ‘printed word’, mainly on Websites such as this one. He still continues to lecture on the subject as well. He is still conducting walks around the City of London as well as the areas within the Inner London Boroughs. On sunny days, when he has the time, he continues to update his image collection by taking pictures and bringing his knowledge up to date. You can contact Adrian directly on the following address (which is shown as an image to prevent automated readers spamming this Website). I even tried the search with horse ferry for a term and still come away with Not Found. What happened to the marvelous: “Horse Ferry, Lambeth” post? I wanted to share it with my 3 groups and a few others who would have marveled to read about it. Do you want to contribute a Grill to CabbieBlog? Not being quite certain of what is required (I have had a look at the articles on your Website) I am not really clear what is required. However, I am happy to give it a try once you have given me a few more details.